The following information explains how to customise your default booking request Template in Tourwriter. We recommend watching the above Tourwriter Webinar: Booking Email Template Customisation, prior to utilising the information below. When you install Tourwriter, a copy of the default Tourwriter.Email.BookingRequest.html template is installed onto each user’s computer. While the standard template is useful in the initial testing stages, you will probably wish to create a customised Booking Request Email Template, for example, one with a different subject line, different colours, or you may decide to completely redesign one. While you can always contact our Support Team (support@tourwriter.com) for these changes (please note charges apply), with a little HTML knowledge, you could create a customised template using the information provided below. The above link is likely to download as an internet HTML file. To make any of the edits outlined on this page, please open your Tourwriter.Email.BookingRequest.html in Notepad or a similar program. To do this, find the document in your “Downloads” folder in My Computer, then right click the document and select “Open With”. If Notepad is not on the list, select “Choose Default Program”, expand “Other Programs” and select Notepad from this list. Save a copy of this template to your TourwriterData\Templates folder, noting that any changes you make will be immediately reflected the next time you make a booking from any Itinerary in Tourwriter (Bookings > List > Make Booking). If you would like to do some testing first, you can save the template to your Desktop and attach as a template, as explained in the Template Testing Instructions section below. HyperTextMarkup Language (HTML) is the main markup language for displaying web pages and other information that can be displayed in a web browser. Tourwriter uses HTML in its Booking Emailer. HTML is written in the form of HTML elements consisting of tags enclosed in angle brackets (like <html>), within the content. HTML tags most commonly come in pairs like <h1> and </h1>. The first tag in a pair is the start tag, the second tag is the end tag (they are also called opening tags and closing tags). In between these tags you can add text, tags, comments and other types of text-based content. The HTML tags will not be visible on your template, but they will be used to interpret the content of the page. The Tourwriter Bookings Emailer Template also uses Tourwriter Tags. The text you see within square brackets, and that start with an exclamation mark, are Tourwriter Tags, for example [!HostName] will pull through the Host Name field from the main Supplier Tab. For a full list of tags for use with the Tourwriter Bookings Emailer Template, please click here. Below are some examples of some basic HTML tags to apply within your template. If you wish to customise each users’ Email Signature, you can do this within the Tools > Setup > My account details (or User accounts area if you have the appropriate permissions). The Email Signature field must be written in HTML. Use span style to make one line or portion of text a different font size and/or colour compared to the rest of the text in your template. The below example shows a mixture of 14pt, 11pt and 8pt fonts, and a switch from Calibri to Tahoma font. The following examples can be coded within your Email Signature field under Tools > Setup > My account details and/or within the Booking Email html template itself. Use the following html codes to fetch an image stored on your TourwriterData folder. Please note that you must resize the image to be exactly the height and width required. The above coding will mean the word ‘Tourwriter’ is hyperlinked to www.tourwriter.com when clicked. The below coding will link the icon (eg.Facebook logo that you have stored on your TourwriterData\Images folder) to the website. The Custom Subtab will show the Red Green and Blue values. 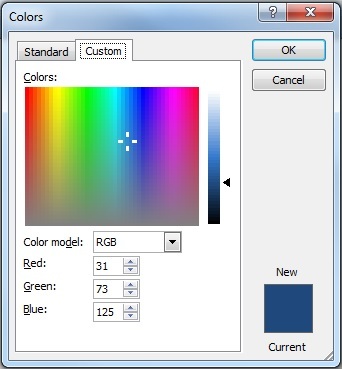 Use this RGB to Hex colour converter to find the value for the Hex equivalent. 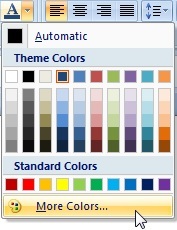 Add the Hex value as the colour, per the below example. Save your template changes. The Company Name will now be shown in this Dark Blue colour on your template. By default, the Bookings Emailer Template Tag that represents the start date of a booking is displayed as Wednesday, 01 April 2020 14:00. It includes both the date of the booking, written in the long date format, as well as the time of the booking, written in the 24HR clock format. This format can be amended by inserting some additional date format Tags at the end of the existing [!ItemStartDate] Tag. The same rules apply to the [!ItemEndDate] tag. tt = A.M. or P.M.
[!ItemStartDate(“h:mm tt”)] = 8:00 a.m or 2:00 p.m. Follow these instructions to test your customised template before making it your default booking email template in Tourwriter. You can also follow these instructions if you have more than one template for sending booking requests (e.g. a Cancellation template). In Tourwriter, open any Itinerary.